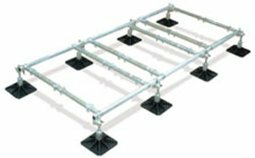 1 metre frame designed to support two condensers back to back, or other singular units. 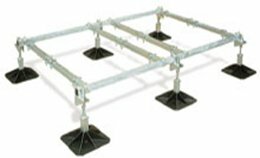 This frame weighs 42 kgs, and has a maximum load bearing of 480 kgs, it is totally free standing with no roof penetrations. No welding, drilling, grinding or cutting on site. Complete solution. Off the shelf. A 2 metre frame as per B6075, weighing 70 kgs, and will support up to 720 kgs. A 3 metre frame as per B6075, weighing 97 kgs, and will support up to 960 kgs. H Frame Kit, 305 sq mm feet, load up to 100kgs, to support ductwork, pipework etc..comes as a complete kit, all you need is strut cut to your desired height/width, and simply slot it into the nylon foot. All nuts, bolts, fixings supplied. Foot fleece and angled AV mats for pitched surfaces available on request. 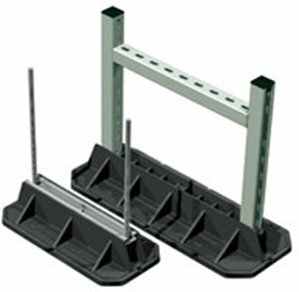 H Frame Kit, 450 sq mm feet for heavier loads up to 150 kgs per set. 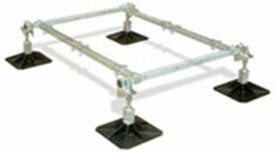 Multi Foot Small 400 x 180mm muti foot for loads up to 77 kgs each, for pipework, threaded rod etc..
Multi Foot Large 600 x 220 Multi Foot for heavier loads up to 142 kgs. Foot fleece and AV mats available upon request. Fix It Foot Small 250 x 180 x 95mm with in built AV properties for small units to support a weight of up to 100 kgs. Comes with slotted channel to support spring nuts for easy fixings. 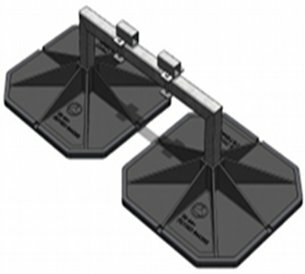 Fix It Foot Medium 400 x 180 x 95mm for a load rating of 200 kgs each. Fix It Foot Large 600 x 220 x 95mm for a load rating of 300 kgs each. Fix It Foot Extra Large 1000 x 180 x 95mm for a load rating of 500 kgs each. 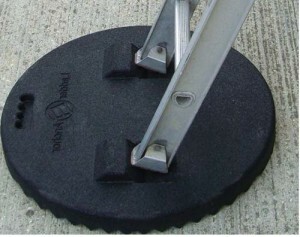 Fix It Foot Low Profile, 250mm x 130mm x 50mm for loads up to 50 kg, with built in AV properties. 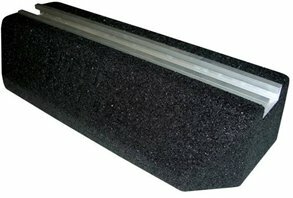 Fix It Foot Low Profile, 400mm x 130mm x 50mm for loads up to 100 kg each, with built in AV properties. 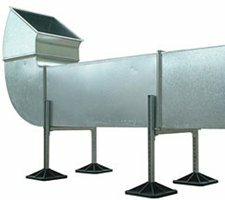 Small Condenser Unit Guard 600×900 unobtrusive guards to deter vandalism and prevent damage to valuable equipment. 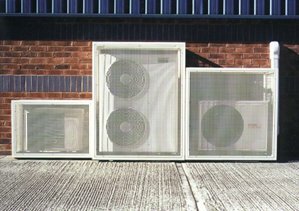 The Guards are simple and easy to install, and all panels are removable to allow maintenance of the unit. Fixed I Beam support including clamps enable very heavy weights (up to 800 kgs) to be supported across an I Beam span. 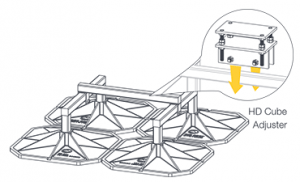 Kit includes x2 600mm mega feet, x2 600mm AV Mats, x2 Clamp kits and a link assembly. 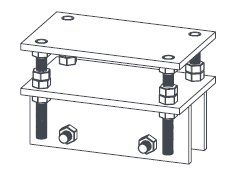 As above I beam assembly supported by 450mm feet for max loads up to 600kg per support. As above but also allows the flexibility of height adjustment on 450mm feet for max loads up to 500kg per support. 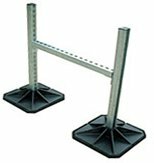 Adjustable I Beam support is as above, however allows the flexibility of height adjustment. Heavy Duty (HD) Cube, x4 450mm Mega Feet, load of 1600 kgs, 600mm high. x4 600mm Mega Feet, load 2000kgs, 600mm high. x4 450mm Mega Feet, load 1600kgs, 200mm high. x4 600mm Mega Feet, load 2000kgs, 200mm high.